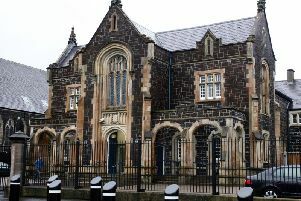 A Larne man who carried out a burglary in the Magheramorne area of Larne, has been given a suspended jail term. Bill Vasilis Georgios Russell (30), of Killyglen Road, previously pleaded guilty to a burglary when power tools were stolen in September last year. On the same date he also was found to be in possession of cannabis and he also admitted that charge. A prosecutor told Ballymena Magistrates Court an alarm was activated in the early hours to show a break-in in progress. Items stolen included a saw, drill and Kango hammer along with some veterinary medicine. CCTV captured the incident in which the culprit was wearing a camouflaged balaclava and a neck warmer. The neck warmer was found a short distance away. Police swooped on Russell’s address and found items including cannabis. The prosecutor said that initially Russell denied the burglary and said he was in bed all night with his partner. The defendant denied it was himself on CCTV. Defence barrister Aaron Thompson said the defendant had now pleaded guilty and that his behaviour was an “aberration” and “totally out of character”. The defence barrister said there had been a number of burglaries in the Larne area but that his client was not a “professional burglar” and was not part of a gang but that his client stood alone for the Magheramorne break-in. Mr Thompson said the defendant, an ex-taxi driver, had suffered a brain injury and his wife is now his carer. He said Russell had encountered financial problems and his actions on the date of the offence had been stupid. Imposing a ten month jail term, suspended for the maximum three years, District Judge Peter King said it was quite clear the property was targeted and that caused him significant concern. He said Russell had 44 previous convictions including for handling stolen goods but nothing of a burglary nature.